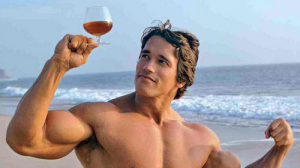 What’s happening, fitness peeps? It’s time for another round of big announcements, relevant news, and random thoughts from yours truly. Get ready to get your science on and reserve your seat now for this special 2-day engagement at Iron in Santa Monica, CA. I’m excited and a bit nervous about this since it’ll be the first time I’ve offered a 2-day seminar on my own. I’ve updated my glute seminar and compiled a new seminar that contains top notch presentations on hypertrophy, strength, and program design. I can’t wait to share these with some of you as I spent months getting them just right. Save $249 when you reserve a seat at both seminar sessions. Reserve your seat HERE before this engagement sells out. 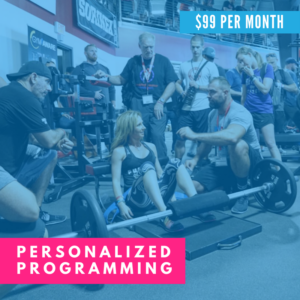 Friends, I am pleased to announce my newest online training product, Personalized Programming with the Glute Guy. This is an exclusive opportunity to purchase a 100% customized monthly workout plan that I create based on your strength and physique goals. Yes, I write the programming based on your input from a highly detailed intake questionnaire. This product is not same as 1:1 coaching, but I think it’s a pretty damned good deal and I am happy to offer this to my readers. If you’ve ever dreamed of working with me, go HERE now to learn more and sign up. Availability is extremely limited and all slots are currently sold out. I’ll be offering new spots each Sunday so check back for your chance to sign up. THIS may be my favorite S&C article I’ve read all year. 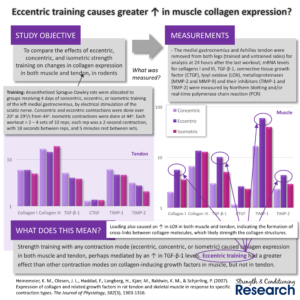 Weeding through and trying to make sense of the literature pertaining to resistance training and sprint acceleration and speed is not an easy task. But Chris Beardsley is the best in the world at this, and I’m proud to have him as a partner with Strength and Conditioning Research! I wanted to film a video detailing the ideal way to perform glute bridges. You probably won’t be able to use/do all of this, but it’s good to know what’s optimal in case conditions allow for it. You will need a pre-loaded barbell, a mini-band or hip circle, and a partner. Three sets of thirty reps constant tension style with one minute rest periods will burn your glutes like crazy. HERE is how it’s done! THIS is a 7 exercise mini-band glute circuit that you can do before a workout for glute activation or after a workout as a burnout. HERE is a simple glute workout you can do at home. No equipment required except a couch. 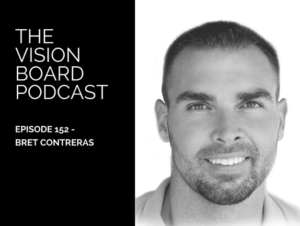 HERE is a podcast I recently did with The Vision Board Podcast. We discussed glutes, EMG, personal training, business, social media, adversity, and the 5 people I’d most like to have at a dinner party. Check out the latest episode of Joe DeFranco‘s Industrial Strength Show. Joe is a legend in our industry so I was elated to be on the show. Timestamps are included at the link. If you want to become a stronger and more powerful athlete, it’s all about the glutes. Check out THIS Men’s Journal blog post to learn why the hip thrust is so effective at isolating your glutes. 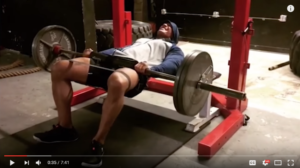 The Rock hip thrusts – damn skippy! 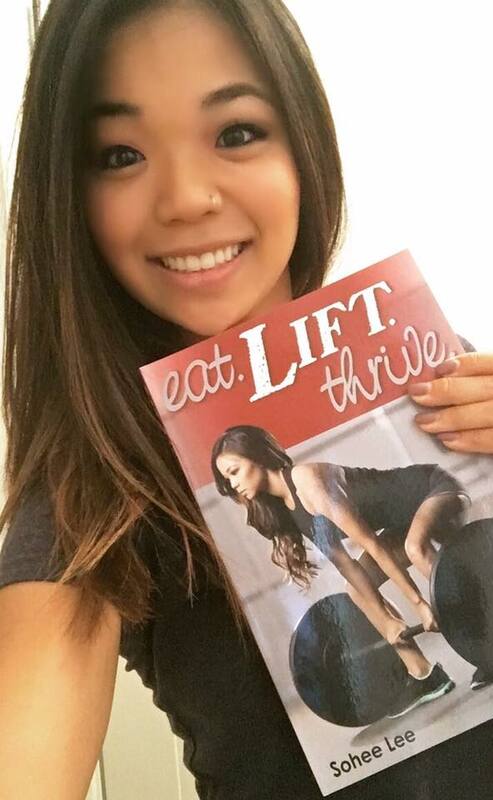 Fitness gals and guys, definitely check out my review of Sohee Lee’s new book, Eat.Lift.Thrive. Sohee knocked it out of the park and I wholeheartedly give this book two thumbs up! Click HERE to see why and read my full review. Please save (free PDF download), print, read, share, and reread THIS article. It’s the International Society of Sports Nutrition position stand on diets and body composition. Reading this makes me darn proud of my friend Alan Aragon, who spearheaded this paper and did a fine job at it. Projects like these make a real difference around the world. Props to Jose Antonio for assembling such a fine team of professionals to collectively take this stand. Evidence trumps dogma! 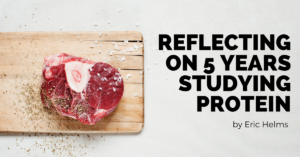 HERE is an excellent article by my colleague Eric Helms discussing recommended protein intake for athletes, resistance trainers, and dieters, and how his current position on the matter has evolved since his first peer reviewed article in 2013. Many novice lifters view pin pulls and block pulls as completely interchangeable. 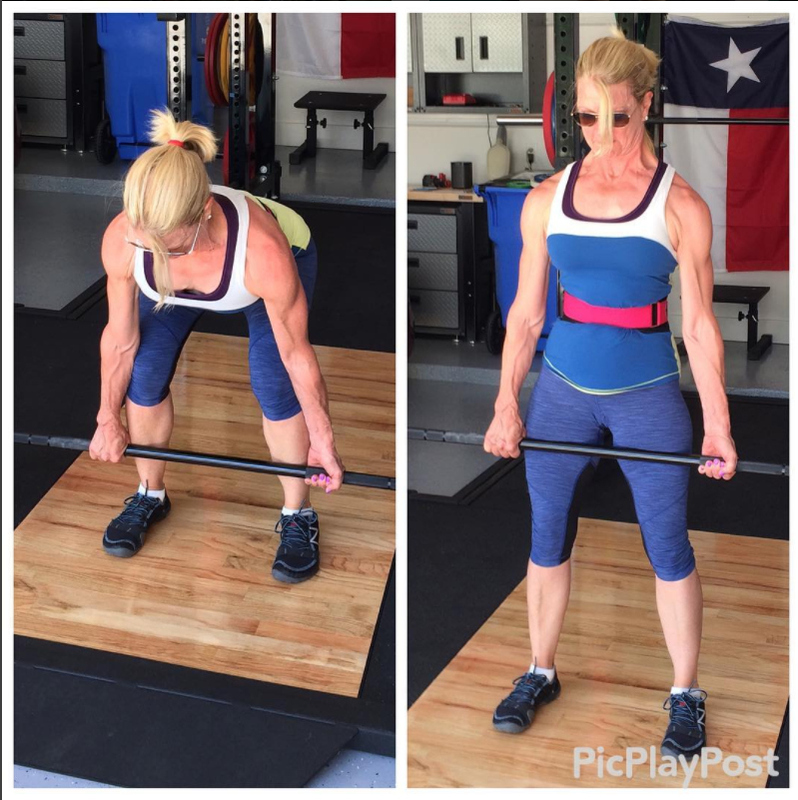 While you can sub one for the other in a pinch, there really are some pretty distinct differences between these two deadlift variations. Dave Tate of Elite FTS spells out the advantages/disadvantages of each lift HERE. 3 time Sports Illustrated cover model Kate Upton is no stranger to the gym. But she hasn’t always been a beautiful sled pushing, hip thrusting badass. Learn all the deets of Kate’s training and improved mindset HERE. Kate Upton (@kateupton) crushes a set of “slide-through lunges", which essentially combines a sliding reverse lunge and a forward lunge into one movement. Start by sliding backwards into a reverse lunge, focusing on taking a slightly longer stride to make the movement more hip-dominant with greater emphasis on the glutes. Then rather than returning to the starting position, slide all the way through into a forward lunge, here with a slightly shorter stride to make the movement more knee-dominant. Repeat in that fashion for 4-6 reps of each, making sure to keep a slow and controlled tempo. While lunges are ostensibly a unilateral exercise, this version actually works both legs at the same while also jacking the heart rate up like crazy. Kate makes these look easy because she’s a badass, but it’s actually a very advanced exercise, so make sure you’ve mastered sliding reverse lunges first, and also hold onto something for balance until you’re comfortable. Take a look at my buddy Ben Bruno’s latest appearance on the Today show! Ben is doing a terrific job of bringing resistance training to the masses. Give THIS comprehensive 7-minute glute developing sequence a try with your workouts this week. Chad is a natural teacher and has written several guest blog posts for this site and I was pumped to see this making the rounds on social media. Here is another great book for you guys to check out. 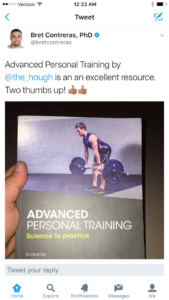 Gold stars and two thumbs up for THIS excellent personal training resource. Definitely consider adding this book to your personal strength training library. Check out this email, this is inspiring! Hey Bret! I just wanted to say thank you 🙏🏼🙏🏼 since I'm following you, me and my clients have made serious booty progress! What shocked me today (in positive way 🙏🏼) was comparing my moms progress pictures! I found a picture from when she was way younger and she looks sooo much better now! 👀 we've made the most progress this last year since we're following you! Seriously we owe you our booty gains👌🏼 #Repost @fitbylina_ (@get_repost) ・・・ I don't believe that genetics or age can stop you from reaching your goals 💪🏼 I believe in hard work, lifting heavy and smart! This is my mom! She started lifting 2 and a half years ago at almost 50 years and this is her result. And we're still not done here 😈 @judyta_fit Credits to the amazing @bretcontreras1 who has made me become a better trainer and bootybuilder with his amazing content 🙌🏼 Knowledge is the key! Alright folks, hope you enjoyed this edition of Random Thoughts. I look forward to seeing some of you in beautiful Santa Monica, CA at the Glute Guy 2-day special event later this summer.